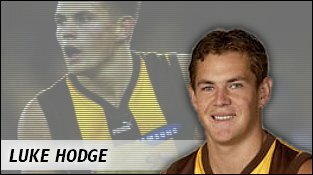 Drafted with the first pick in the 2001 National Draft, Hodge came to Hawthorn with a mountain of expectation and didn’t disappoint in his first season of AFL football. A tall midfielder who is good in the air and possesses a sublime left foot kick, Hodge amazingly finished sixth in the club's Best and Fairest award after playing only 15 games in his first year. Suffering from osteitis pubis on arrival to the club and starting off at Box Hill, Hodge impressed so much in the opening rounds that he had to be selected for the round five clash against Richmond. His height and footy smarts allow him to be played virtually anywhere, but it is in the midfield where his future hopefully lies. 2004 was another season cruelly interrupted by injury, however Hodge settled in the second half of the season, showing great leadership abilities. 2005 was the season where Hodge announced his arrival as an elite footballer. It would be hard to single out a poor performance in his 21 games, his only blemish being a club suspension due to over indulgence at his 21st birthday. 2006 was another good season for Hodge, despite being forced to carry ankle and hand injuries all season. By the end he could barely run, so he moved to CHB where he controlled the play for the final month of the season. Hodge had another great season in 2007, playing forward a bit more. His performance in the Elimination Final is bound to become the stuff of legends. Injuring a knee early on, Hodge returned to the fray and turned the game with an inspired final quarter. Hodge is the embodiment of the future of the Hawthorn Football Club. He has the tools to rise to the absolute top, and such is his influence that a club will surely rise with him.